New York City, April 2012. People are plagued by negativity at random, increasingly frequent intervals. No one knows for sure why this is occurring, and media speculation likens it to the Apathy Syndrome of Japan that disappeared as quickly as it surfaced one year ago. Enter the students of the Jones Academy for Talented Youth. One by one, certain students have found that they are becoming aware of the hidden time in which the incidents causing the negativity occur. "Hot Spots", as they have come to be called, pop up all over the city, spilling Shadows into our world, where they affect us from this Dark Hour, and normally cannot be spotted or fought. However, these gifted children have the potential to face their other selves and fight back against the darkness. Their weapon? Personae, and the Evokers they use to call these beings forth. Equipped with technology supplied to them from a mysterious benefactor, represented by Professor Jane Connors, a professor at their school who not only gives crucial guidance to the team, but sponsors them as a very private school club of sorts, they are able to locate these Hot Spots in the city and track down the Shadows in the Dark Hour. What gets tricky for the team, though, is that in addition to fighting off Shadows by night, they have friendships and school by day to take care of! Luckily for them, the dorms (each member of the team is transferred to the O'Brian dormitory, where their equipment is located) and the school itself are located in the city. Juggling these tasks all together will be key to saving the world, as the relationships they build at school strengthen their Personae. Note: There will be ONE character allowed to have the Wild Card ability (ie, like the protagonists of P3 and P4, be able to equip more than one Persona and be able to access the Velvet Room, etcetc.) Mention this in your app if you would like your name in the hat, and if you are selected your Arcana MUST change to the Fool. Barring any other important tidbits I've forgotten, this RP will start once 5 characters have been accepted. Okay now that I got the fan boy of me in the open ill get straight to work reserved fore template. Appearance: Claire stands at about 5'6". She keeps her strawberry blonde hair cut to shoulder length, and usually wears a thin black headband to keep it in place. She is quite pale, which complements her deep blue eyes nicely. She keeps her short nails done French-style, and wears a red bow on the center of her all-black school uniform, save for the Jones Academy insignia on her left breast. She has a small scar on the right underside of her jaw from an accident climbing a tree when she was little. Her thin lips are almost always in a wide smile. 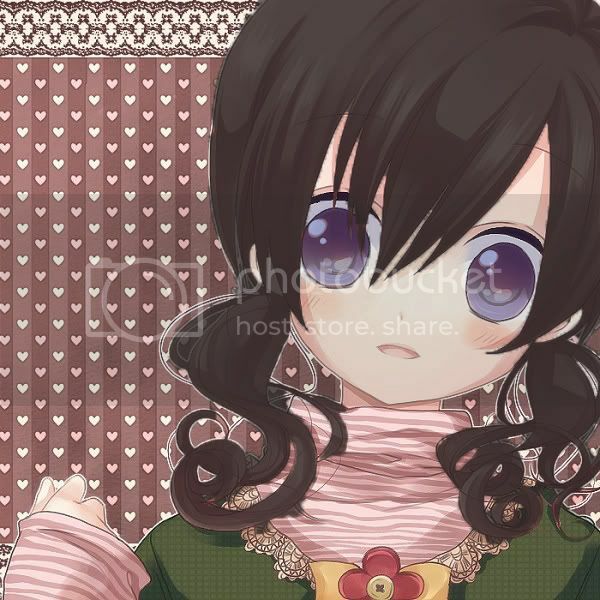 Personality: Claire is incredibly outgoing, and unfortunately incredibly ditzy. Her cheerfulness attracts a great many of the male population of JA, although she is a tad oblivious to all the male attention. Despite her ditziness, she tries hard in class and is a decent student. She has a fondness for animals, and as such spends many of her free afternoons and weekends at the Central Park Zoo. That is, when she isn't out shopping for new clothes. Ever since partnering up with Ace and awakening her Persona, she's been a lot more focused and takes things slightly more seriously than before, although it's clear she is still a free spirit. Battle Style: Claire carries a giant, foldable scythe into battle to cut down Shadows. Persona: Demeter (upon evolution, transforms into Hera). Demeter excels in Garu magic. Furthermore, while she has access to the Dia family of spells, her use as a healer is limited to a single target. Her last support skill is (Ma)Tarukaja, enabling her offensive capabilities to increase. Physical attacks from Demeter are limited to forcefully lobbing her spear at Shadows. Demeter appears as a thin, armor clad goddess with a spear in her heavily gloved hands. Her eyes are covered by her helmet, and her long brown hair extends to the bottom of her back. The armor cuts off midway to her arms and legs, revealing fair, glowing skin. Upon a personal evolution on Claire's part, Demeter transforms into Hera. Hera gains access to Bufu magic at the cost of Demeter's physical abilities. Furthermore, her use as support improves due to the addition of (Ma)Rakukaja to her arsenal. Hera's appearance is essentially Demeter once her armor is shed, with a glowing white gown taking it's place. Hera also has white angelic wings, soft facial features (although a golden olive branch visor continues to obscure her eyes), and a staff replaces Demeter's spear. Backstory: Claire's parents divorced when she was 9, and ever since then she's been shipped off to boarding school. The divorce and her subsequent moves to schools out of the state (she is a Colorado native) have deeply troubled her and given her a fear of being alone, a fear she overcompensates for by means of the magnetic personality she developed in her pre-teen years. After middle school, she expressed a desire to study in the city, and her mother and stepfather agreed to let her live with her aunt in the state when school was not in session. Upon arriving to JA as a 9th grader, she immediately became a person of interest, being the only student in her grade that had not hailed from the East Coast. She briefly dated a boy named Jackson that year, but dumped him upon finding out that he had cheated on her with a girl back home. In February of this year, she and Ace both gained an awareness of the Dark Hour and witnessed the opening of a Hot Spot 2 blocks down from their dormitory. The Hot Spot deposited a large mass of Shadows that eventually became their Shadow Selves, and Claire quickly had to confront the fact that her cheerfulness is a mask to hide fear, that not everything can be resolved by optimism, and that she needed to take her life more seriously. Once she accepted that, her Shadow transfigured into her Persona, Demeter, the goddess of the harvest. That night, upon her return to the dorm, Professor Connors explained to her and Ace what they had just witnessed, and how vital it was that Shadows be eliminated. After Connors offered them their Evokers as a means to fight this battle, the Specialized Extracurricular Execution Squad of Jones Academy was established, with the three of them as its founding members. 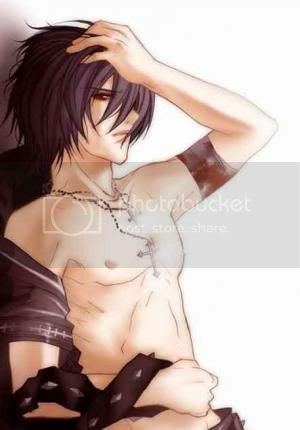 Appearance: Myde stands at 5'3, with long, black free-flow hair that falls to his waistline. He is always seen wearing a pink sweatshirt with blue sweatpants; regardless of the weather. He usually wears mocassins, though if the weather necessitates it, brown boots. He also wears glasses at all times, even when he's asleep. His skin is somewhat tan, which brings out his red eyes. Hiss arms have been pecked at with syringes and needles so much that scars have formed all across his arms. As such, he hesitates to go shirtless. Personality: Myde is a very calm person. While others would be up and about, Myde would be sitting inside, reading foreign novels or watching cooking shows. He is known not only by the team, but throughout the town as a sage of sorts. People often go to him for advice due to his academic ability and wise disposition. However, due to his situation, (see Bio) his wise expression belies his sorrow. Myde's inner depression is very strong, and despite being able to give advice, has a hard time following it himself. When alone, he will sometimes cry to himself. When out with others, he makes little attempts to bond and goes out of his way to be ignored. This prevents him from establishing little more than fleeting ties with most. This should not be mistaken for indifference. (though most of the time, it is) Due to his hesitation to form bonds, nobody, even the team's leader, knows of his situation. If anyone ventures into that area of conversation, Myde will grow irritable and less open; especially venting into anger if the topic is pressed on. Though he has taken an interest in [Insert "The Fool" Character]. They may be the first person he opens up to. 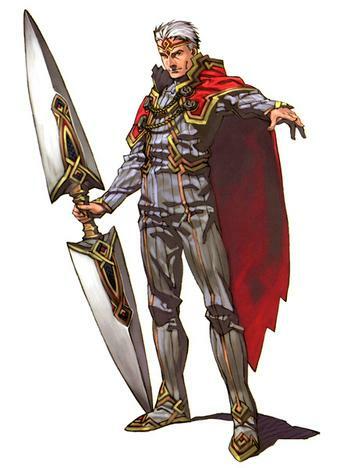 Battle Style: Myde uses two chakrams (Ring Weapons) in battle, forgoing power for agility. As such, this makes him a highly evasive character. While he isn't the weakest member of the team, his Attack still leaves a lot to be desired, making him a good first/follow-up attacker....if nothing else. Myde is best used as a scout, running circles around enemies so that the others can dish out the proper damage. Role on the team: Support, in the form of weakening his enemies with debilitative magics; making them less able to defend against attacks from his allies. Persona: Despite his wise expression, Myde's inner depression is his most powerful emotion. Thus, upon his near-death experience, his Persona took the form of Algos, based on the Greek God of suffering and sorrow. Algos looks like a bloodied, disfigured corpse. Anorexic, bloody, and wounded. It's limbs are in vicarious positions, implying that it may have had it's bones broken. Algos has thorns all across it's arms; it's eyes blindfolded by a white cloth; and it's feet grounded by nails. Upon it's evolution into Hades,(Based on the Greek god of Death) Hades becomes a more humanoid figure. Hades gains pale skin and a purple cloak, losing it's wounds, blindfold, and disfigurements. While Hades still specializes in debilitative magics, (Which are simply next-level versions of those learned as Algos) he also gains the basic Recarm spell. Backstory: Prior to coming to the Jones Academy, Myde had spent much of his life in the local hospital. From a young age, Myde was diagnosed with a terminal illness that is slowly ebbing the electrical impulses of his muscles and brain, with the final result stopping his life completely. As such, he has led a sedentary lifestyle, traveling in and out of hospitals and shelters while lying on hospital beds. Myde's parents decided that he would rather spend his life doing something other than sitting on a bed until he dies. Therefore, they sent him to Jones Academy (With his doctor's permission, of course) in the hopes that he may spend at least some portion of his life immersing himself in the world around him. However, contrary to his parents hopes, Myde went out of his way to be avoided, not forging any bonds and drowning himself in academic work and literature. Around May, Myde gained a special awareness into the Dark Hour, and saw strange creatures flowing from a portal. Eventually, they turned into his Shadow Self. Sure that he would be killed, Myde prepared himself for the finishing blow, only for his Persona to manifest as Algos. A long time after being taught of Personae and hunting down Shadows, Myde finally accepted his new-found friendships and realized that he didn't need to bear his suffering alone. Upon this realization, Algos had evolved into Hades. Extra Notes: A time after he had received his Persona, Myde had a tendency to cough up blood at random times during battles, especially after using a powerful attack. This implies that his Persona powers may in fact be accelerating the spread of his illness. That's fine, but you're supposed to get your Persona sometime in the events in the RP (It starts in April, your profile says Myde got his Persona in January). Fun-Fact: Up to the point of where he gets taken by the guys, that is my actual past. Uriel: He stands at roughly six feet in height with a body build that has obviously seen some form of work. But this fact is rarely seen outside of his living quarters. When there he feels that he is simply there to relax and wears only the bare minimum. That's why he tends to walk around with only a pair of blue jeans on. On some occaisions one can see him walking around with a pair of sneakers on, but people tend to just focus on how strange it is for him to walk around without a shirt. It's at times like this that people can truly see the necklace that he always wears. For the most part he keeps the cross hidden under his shirt, but when he goes without one, it is clearly visible. Otherthan his outfit for relaxing at the place that he lives he can be seen wearing various things depending on the weather. When it's hot outside he will typically wear a pair of blue jeans with a white or black t-shirt that seems to always be tucked in. When it's cold though he will simply add a black leather jacket to the mix. Another thing that can be noted about what he wears is the fact that he almost always wears a silver watch with a metal band that clips into a locked position. The actual face of the watch is a navy blue with silver roman numerals. Looking at the metal that makes up the watch shows that it is quite old and worn, but otherwise just a normal watch, granted it is one of the first Timex Indiglos ever made. As for his features themselves, there are some that like the way that he looks while there are others that are scared of him for it. That's because he always has his raven hair longer than it needs to be and this tends to get into his saphire eyes. When it comes to his face, it is said that he would look better if he just smiled more often. But as it stands he rarely smiles at all and this leads people to think that he's always upset about people. Otherwise his face shows his strength of body and somewhat his weakness of character. To say that Uriel is a little morbid is quite the understatement. It's rare that he actually sees thing optimitistcally and will often times poke fun at those that do. As one would expect, he's quick to give up when things start to look bleak, prefering to just accept his fate. But then there's always the chance to turn him around. While he will never admit it, he is easily influenced by those with strong convictions. He thinks that it might tie in with how he thinks that things can always be turned another way as long as a person has allies. Through this it can be seen that through his hostile exterior he secretly wishes to be accepted by others, a form of rebirth if you will. Of course, this when he's not actually fighting anyone. When he fights, he is commonly compared to Death himself. He fights with the ferocity of a demon and just about as much compassion. The only thing about it is the fact that he shows no sign of enjoying the fighting as any demon would. Instead he just goes about things with a cold precision making people think that it's simply his job to fight. Because of this state of mind he will often times get right back up after taking a hard hit, but he has his limits. If he lets his mind get carried away on thinking of something it is quite common to see him go down and not get back up for a bit longer. It's really unclear as to why he is like this. When it comes to interacting with other people, he could definately use the practice. The only issue with this is that he would prefer to avoid people in general. That's why he doesn't like to spend too much time with people and instead opts to spend his free time playing video games or watching DVDs, mostly anime. But even he gets the urge to share this with someone. When he actually does move on these urges though he often leaves the person agreeing out of fear and then never showing up. So social graces are not his strong point. Yoshimitsu: The 3rd shogun of the Ashikaga shogunate who ruled from 1368 to 1394 during the Muromachi period of Japan. Yoshimitsu was the son of the second shogun Ashikaga Yoshiakira. In the year after the death of his father Yoshiakira in 1367, Yoshimitsu became Seii Taishogun at age 11. Double Fangs - Inflicts a small amount of Physical damage twice on one enemy. Swift Strike - Inflicts a small amount of Physical damage up to twice on all enemies. Agi - Inflicts a small amount of Fire damage on one enemy. Mudo - 25% chance of instant death from the power of Darkness on one enemy. Counter - 10% chance of repelling Physical attacks when not knocked Down. Mudo Boost - Darkness-based attacks are 1.5 times more effective. He will take on a second form later on in the course of the story. What is it that makes someone become so bleak on their outlook of life? Death of a love one is a given, but is that all? Not for Uriel it is not. In truth it all started with a single death. The death of his grandfather who seemed to have taken the place of his missing father hit the young boy hard. For the longest time the two were just like a real father and son combination, but that didn't last thanks to a sudden heart attack. That just left Uriel in the care of his irresponsible mother. Because of this and the fact that the woman would not settle down in a single spot she would always move around in order to live with her next boy friend. For a while this is was never a good thing for the young boy because he would often times be left to take care of himself be it cooking, cleaning and even school. He was forced to learn these things or possibly go through some sort of pain. But shortly after he turned six years old this somewhat changed. For the longest time he had hated his mother, but even he has to admit that she does some good things. One such event was on the day that she gave birth to his little brother. At that point it was extremely rare to see Uriel without seeing Adam in either his arms or in his crib with Uriel acting as an ornament. But even this was not to last long. Some months after Adam was born he died in his sleep. The tests showed that he suffocated in his sleep when he face got lodged between cushions of the chair that his mother was sleeping in. He was dead before the morning. From that moment on Uriel was a shell of a human. He had lost not one, but two of the people that he valued more than his own life before he even turned seven. But this did not change the woman that he was living with. No, she simply continued to live her life like an out of control teenager until the day that some men showed up at her house. She was drunk as usual so she was a little more violent than what she needed to be and this only made the men take Uriel from her faster. As it turned out the men were with Protective Services and had come to take the child from a destructive mother. But seeing as how he had no living or known relatives he was placed with a foster family. For years this was the case, but none of them could ever get through to him. They had no problems with him in school considering that he always kept his grades up and he never got into any fights. It was just like the family adopted a walking corpse. Finally they approached the child and presented him with something that they were waiting for. They had personally hoped that he would have learned to open up to others before they sent him to the school, but he was old enough before that happened. As such they gave him the choice to go to the school where the two of them had met when they were students themselves. They were perfectly clear that they were not just shipping him away by telling the young man that they planned on sending all of their children to the same school before they found out that it was impossible for them. The two were actually expecting Uriel to refuse to go to the school, but he surprised them by saying that he would go to the school simply because they went there. Appearance: Though quite thin looking to most, Nilsen still only stands around 5’5 - 5’6 tall. His thick brown hair being rather short, still manages to fall from time to time down in front of his eyes, which in turn would always cause the young man to brush the clump of hair to the sides of his face. Skin being quite pale, due to the amount of time he spends inside and away from others, it gives him a rather lonesome ghostly appearance. To go along with not wanting to be noticed, Nilsen for the most part wears very plain looking clothes. A generic pair of dark blue pants, along with that of a matching t-shirt and common looking sneakers, is something Nilsen seems to wear in all seasons. The only difference being that of a black long coat he adds when in colder weather. Carried with him at all times however is a cell phone, which he seems to use more as a clock than anything else. Personality: Due to his incredible shyness, no one can really say what Nilsen’s personality is, except of that from his parents. When much younger, and before this bout of reclusiveness, Nilsen was a very cheerful kid. Always playing, always having as much fun as possible with the many friends he had, especially vocal during class, no one to this day has any idea of the true reason why Nilsen suddenly changed. Nowadays Nilsen’s personality is very defensive. If one was to try and talk to him, the young man will simple appear to panic a little before making excuses and apologizing in order to leave. Shadow Self: Nilsen’s shadow reveals the pent up emotions the real self contains inside him. When only six years old, Nilsen’s ever growing group of friends included that of a few of the more unsavoury characters of the school. Though he got on well enough with them, there were times when Nilsen was merely, pulled along for the trip, during some of the activities they got themselves into. During one such activity, something Nilsen to this day has no idea how he arrived to, the young man found his ‘friends’ beating on someone Nilsen knew quite well. Not wanting to play along, but not able to stand up to them, Nilsen could only silently watch. After that day, Nilsen went completely quiet. As time went on and the silence only continued, more and more of his friends slowly drifted away, until there was no one but himself. Nilsen’s Shadow still retains his feelings of the day and those that followed. More than anything being that of the anger and guilt he has for himself for not being able to do anything, to which he completely blames himself. Battle Style: Double bladed lance (Like the mythical spear Gungnir), while focusing more on the weakening and strenghtening of characters. The World Tree. 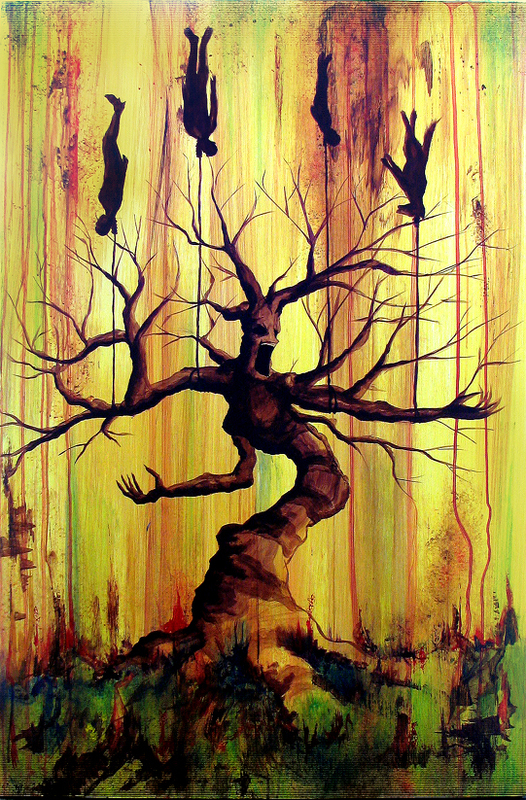 The massive gnarled tree sways and moves its body, clearly showing the energy it holds within its form. From below its base within the sprawling roots, to the very top of its bright green leaf covered branches, the tree not only shows it is full of life, but clearly that life lives upon it due to the sights of the various creatures that run along its body. Specializing in the use of the Bufu variety of spells, the Great Tree uses debilitating magic in order to absorb and cancel a variety of attacks. Whether this would be in the form of Nulifying, repel or even drain. 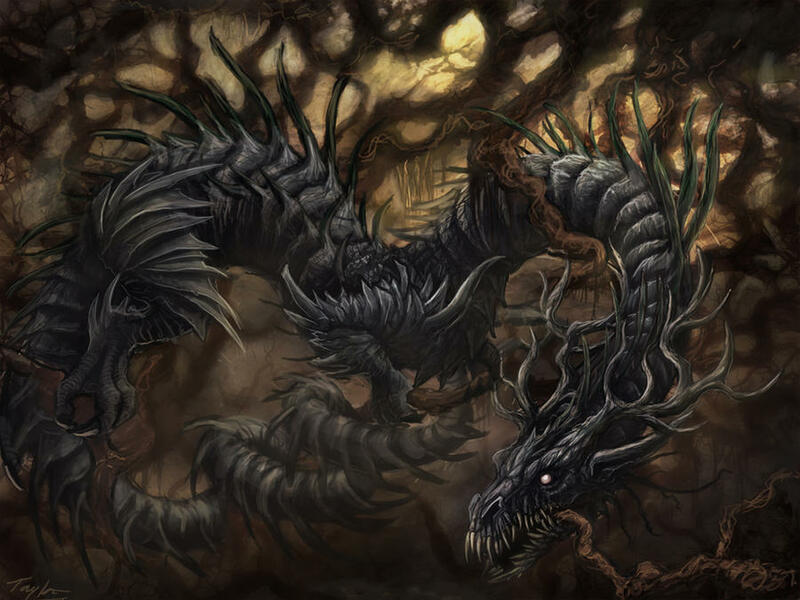 Shadow version (Image): The rooted form of Nidhoggr is coiled within the strangling roots of the massive Yggdrasil tree along with others who inhabited it, now a wiggling masse of rotting branches and vines. 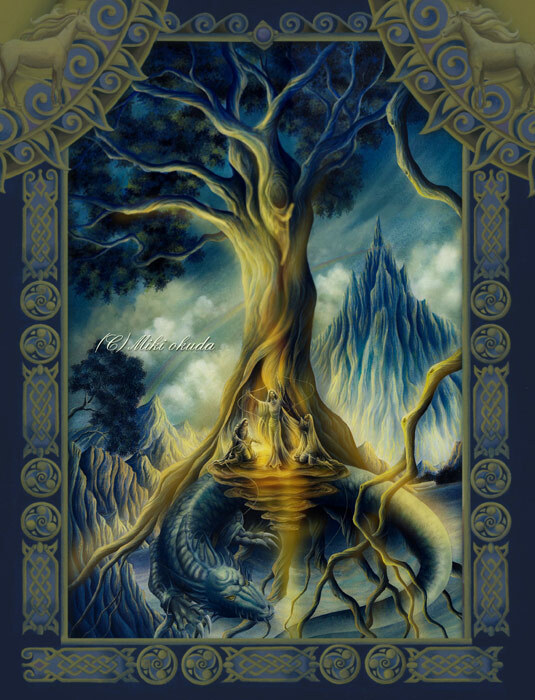 The roots trap the massive dragon below its form, while also forcing the creature to move and attack to the shadows will, perched within the heart of the great dead tree. Backstory: Some people would say Nilsen was a boy who kept to himself. Not terrifically great grades, but not necessarily that bad, the boy seemed to just barely get through his various classes and subjects in silence. His family noticed this difference as he got older, when he would change from the full of energy boy while at home, to the immense shyness that seemed to cripple any kind of interaction he could have with another living person. This didn’t get any better once his family were forced to move to New York, on account of a job transfer Nilsen’s parents got. Destroying any sort of progress that was made, Nilsen reverted back to his quiet, shy self, hiding away from any sort of activity that would have him be around other people, unless absolutely necessary. Every school day is the same for Nilsen. One of the first to arrive in the Academy, he goes straight to the first class that day where he sits in the corner out of the way of anyone. For the entire day he then will arrive in each classroom without anyone noticing him, before leaving at the end of the day once everyone had nearly left. Once the end of the school week has ended, Nilsen never seems to venture out of his family’s apartment without very specific reasons. Even while at home the young man seems to keep himself out of his parent’s way, that is whenever they are home from their conflicting work schedules. From within his room however music can be heard always playing, muffled as it might be from the apartments walls. This seems to continue even longer on days off for Nilsen, but still which promptly ends once his parents arrive home. Extracurricular Activities: None inside of school, but seems to be rather fond of music. I've been looking for a Persona RP forever, but never could find any open. Appearance: Will a picture suffice? 5' 3", Brunette/blackish hair, blue eyes, very fair skin, large breasts, frail appearance. Despite her age, she looks no older than fourteen years old. Personality: Adrianne is at first very quiet, until one gets to know her. She then shows her more playful side. She's also a bit lazy, always procrastinating on homework and instead opting to play video games; she's always seen holding her handheld gaming device. She's often called eccentric but cute and has many male admirers, but insists that she doesn't mean to come across as looking younger than she is and that it frustrates her when she's treated like a child. Adrianne actually thrives off of the attention she receives from boys (and girls), due to the fact that she misses her father, who spoiled her and loved her with all his heart until his death when she was only ten. She reveals that none of the boys at school will ever be good enough for her, as they're too plain--instead, she desires someone "worthy and handsome enough to be her main character". She's bored and enjoys getting different reactions out of people, as if they're her playthings or her own "characters". Battle Style: Suited for magic/healing; weapon is a staff. While her magic is exceptionally high, her physical defense is low, making her a glass cannon. Her staff doesn't make a good bludgeon, so asking her to use it to whack a shadow over the head isn't a great idea. Thanks to her healing abilities, though, she can keep herself and the party alive. A pair of young, doll-like twins that hold hands as one. Hansel will make a motion for healing moves, while Gretel does so for damage based attacks. Both have wavy black hair and light brown, almost crimson eyes. Hansel wears a red doll dress with a giant pocket on the chest, and Gretel a pair of blue short overalls with a black undershirt. If I can draw a picture later, I will. Adrianne's family has been torn since she was five years old with her parent's divorce. As an only child, she felt lonely and turned to the imaginary worlds of books and video games to ease her tensions and turn her mind away from her problems. Around her mother, she was ignored and left to her own devices. But with her father, she was lavished with love and gifts every time she went to visit him. She loved her father very much and demanded all of his attention. She became estranged from her peers, often getting into fights with them or pushing them out of line so she could "be first". Obviously, she lacked basic social skills due to her reclusive and selfish behavior. At age ten, tragedy struck--her father was murdered in the city one night by a common mugger. He was shot five times and didn't even make it to the hospital. Adrianne's spirit was destroyed and she became more indulged than ever in her own private world. To make matters worse, her mother began dating a man that she didn't approve of. He was strict and didn't allow her games as they "rotted her mind". Books were all that were left for her, and she spent all of her time at the library. Middle school came around--an awkward time for everyone--and the girl found herself unable to make any friends despite her attempts to form some kind of bond. She was no longer so concerned with being the center of attention as any time she was the results were often negative. She was made fun of for her tomboyish ways, whether it was the cruel giggle of a group of gum chewing girls by their lockers or the thrown, open milk carton hurled by a boy in the lunchroom. She found girls to be too involved with their looks and focusing on boys, and boys were too focused on their masculinity to be seen hanging out with a girl. It seemed no one understood her, so back to her books she went. By the time high school rolled around, her body had undergone the transitional changes of puberty. Adrianne was determined to receive the attention she'd been missing from home. She began taking more pride in wearing cute clothing instead of just T-shirts and pants. Ditching jeans for cute skirts, she found herself suddenly flooded with the attention she'd been seeking all along. Though still shy and awkward around people, she never found herself without someone to talk to. Thanks to years of reading and writing on her own, she was a grammatical genius despite deficiencies in her mathematical scores and accepted into the Jones Academy for Talented Youth. This made her very happy as it was a means to get away from her new stepfather and go back to her hobby of gaming freely. She hopes to one day be a famous author and to share her own universe with the world. I've given the other two a cursory glance and will read them after I get cleaned up for the day, however, I did want to say one thing. Hecxy, I should have clarified but by support I meant filling a role similar to Fuuka and Rise in the games haha. That one is my bad. Oh okay, then~ I had kind of wondered about that. Oh yea, meant to say this before. But what school system are you talking about in terms of year? I ask because Year 13 is normally college. ..Unless he's counting Kindergarten as the first year. I was confused about school, too. My head said 13th was junior year of high school, but looking back on it, I was wrong. He's in 11th now. You might want to space out your template Angel. The School System? I'd have to ask Angel but I believe it's the same as it is here in America. Appearance: Ace stands at 5''11 tall and he has a tan skin complexion. His hair is long enough that it falls just above his shoulders, and is colored a dark auburn. His hair is usually let loose, though he takes care of it so it keeps its natural sheen. His eyes are a piercing aqua, and rather narrow. They are the first thing people tend to notice when they see him. He has a timid yet determined gaze, as if he knows to take things in stride. The rest of his facial features are soft and non-threatening, a complement to his gentle nature. He has an almost androgynous curvature to his face, with a non-threatening jawline and subtle nose and mouth. His body is fit though he’s not muscle-bound, he does a lot of cardio training so he has a high amount of stamina. As for his clothing he tends to wear very baggy clothes. He doesn’t like to have his movement restricted. Personality: Ace is a reserved kid. He doesn't talk much, and when he does it tends to be brief. He occasionally speaks more, however he only does so when he believes a strong point must be made. He carries himself with an air of maturity not seen often in kids his age, which shows in how he perceives and treats others. He always approaches people in a calm and kind manner, and has a knack for getting on everyone's good side. He is pretty much incapable of telling a lie as he believes they just create more trouble in the long run, and he can be counted on to keep a promise. He doesn't like hurting others, and will try anything to resolve a conflict without casualties. Even if the person is his worst enemy, Ace will still find room for sympathy. Ace's kind attitude can also be his bane. He puts too much pressure on himself to succeed, and often becomes depressed if he lets someone down. He can also be stubborn if he sees things in a different light than someone else, and while he is a logical thinker he will not accept any solution that threatens someone's well being. Well, at least this is what Ace 'seems' like. He has constant thoughts that contradict these feelings, and he knows he has to fight them, otherwise he knows he would fall into a VERY dark place. This is connected to why he chose to support the team instead of fight, though how so I can't say just yet. Battle Style: Yeah~ him fighting is a bad idea... For a few reasons. Persona: Norn A persona of the Fortune arcana, imbued with the power of foresight and the element of wind. Ace has yet to see his base Persona, which worries him greatly. Backstory: Ace was born into a wealthy family, His father was a well known politician while his mother was a doctor. His father was a cold and calculating man, relentless in his pursuits and a stonewall to opposition. This is not to say he was a bad man, his views always had the interests of the people in mind. Ace's mother is like a calmed offset to his father. She always had a content glint in her eyes, sympathy and understanding were first nature to her. Growing up Ace hardly ever saw his father, though the rare times he did the man always had sparse yet resounding advice for him. His mother was hardly ever not in his life, and even though she spared only vague words to him at times her actions spoke for themselves. Whenever a problem arose she never hesitated to throw herself into it, resolving to fix it. Once it was time for him to enter high school Ace was put into Jones Academy. He quickly settled in, finding his place among the students. He became fast friends with Claire, Who he'd share a life changing event with. Together they encountered what they would later learn are 'hot spots.' They also met their shadow selves, however Ace's experience with his other self was vastly different than Claire's. His shadow did not attack him nor threaten him, instead it seemed content just letting Ace know that it existed. Ace had something inside of him, something he didn't want anyone to know about. To help curb his inner turmoil Ace decided to offer support to the future SEES team, for fear of what battle could bring out of him. Hecxy, what's Adrianne's last name? Aside from that, everyone else looks good! Just one more (once sephiroth2 finishes up or Hecxy edits) either I or PL will start the thread). It's Vanguard ^ ^' sorry don't know how I forgot that. Hecxy, sephiroth2, you're accepted. Though you should know the link to Gungir doesn't work. Piercing if you wanna start the thread up now, go for it! If not I'll have it up sometime after 5 PM EST (eww work).